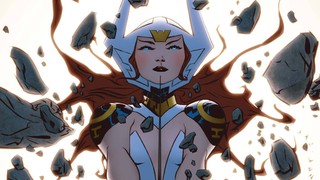 It’s a quiet week for new releases in comics, but nothing really is quiet when you get DC animation maestro Bruce Timm giving us his take on New God Bekka as Wonder Woman. Joining Wonder Woman in this week’s new series? Why, satanic rock bands, metaphysical crime tales, a Red Sonja/Conan team up, and more!